Our Premium Eco Wool Batting is only available to order over the phone. Our Premium Eco-Wool Batting is pure and clean. Domestically produced, the majority of our wool comes from the state of Oregon and is carded into batting at the Woolgatherer Carding Mill in Montague, CA. Our wool batting is now available in 1, 2, and 3 yard pieces! Our Premium Eco-Wool batting is the highest quality batting we have worked with in the past 25 years of making wool bedding. 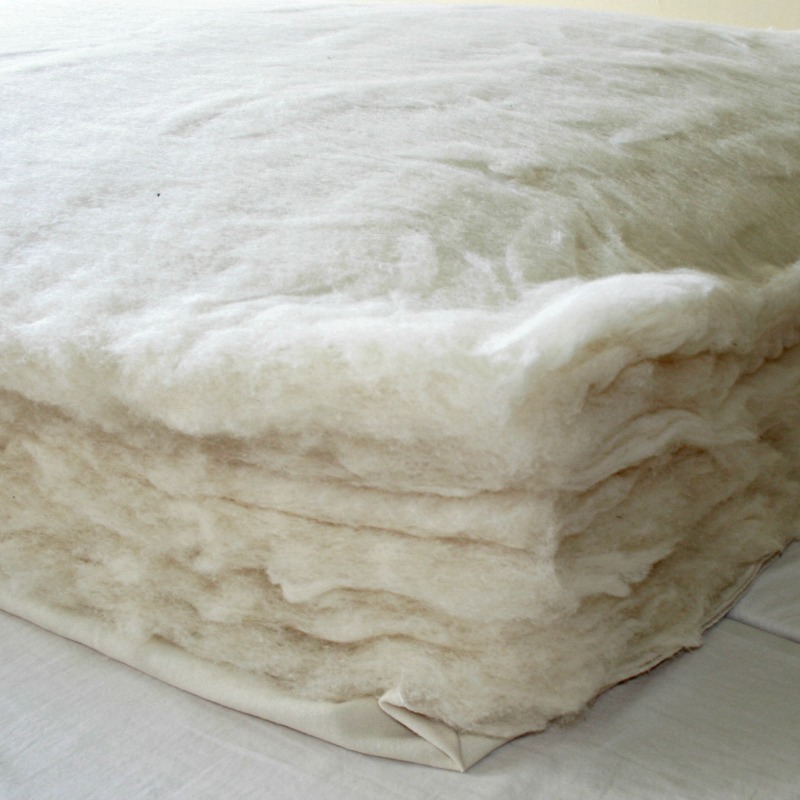 A soft and resilient wool batting, use it as the filling for bedding and toys, or make your own felted crafts. 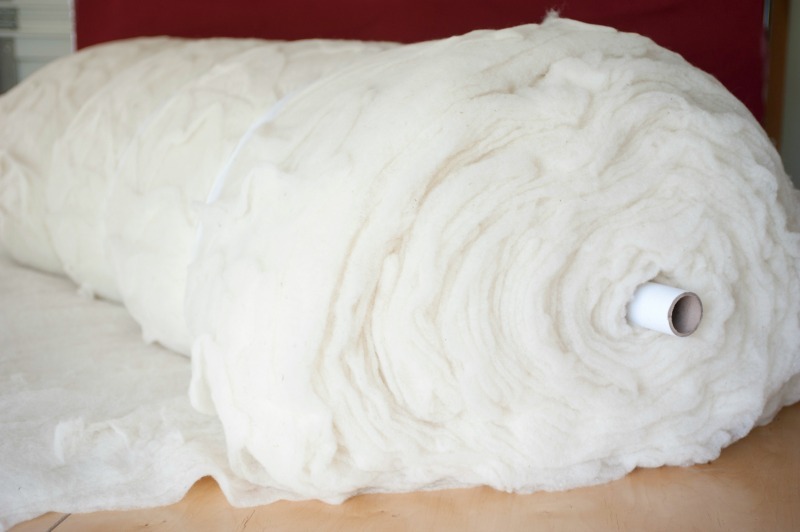 Our wool batting is available in natural off white. Our comforter batting is 2.1 lbs per linear yard and about 1/2″ thick when lofty and our extra thick batting is 2.8 lbs per linear yard and about 1″ thick when lofty. Wool batting weights and dimensions vary slightly from piece to piece. 3 yards of thick batting will be compressed in the box but will spring back when removed from the box. Please call us for pricing on single pieces larger than 3 yards. Please write in the notes section if you would like your multiple yards sent in separate one yard pieces. PLEASE NOTE: OUR WOOL BATTING WEIGHTS ON THE PRODUCT DETAIL PAGE ARE APPROXIMATE WEIGHTS. OUR WOOL BATTING FLUCTUATES 10% UP OR DOWN BASED ON CARDING TOLERANCE. CALL FOR DETAILS. I just want to say a big ” Thank You ” for offering this SCRAP WOOL for sale. I bought a King pillow for myself ( which I left a review ) and decided to try some of the scrap wool for some projects I was doing. Love it !!! I’m a “crafty” person and am always in need of filling materials. I hate to buy that polyester junk they sell in the stores. Its so nice to be able to buy something healthy like this when I make stuffed toys for the kids. And for anyone interested, just so you know, it is scrap material. If your into making quilts or anything like that, then you should probably stick with the batting. But for me, for the things I use it for, it works great !!! I’ve also left a review of the King 38oz. pillow. The pillows are also terrific !!! I would never hesitate to buy any products from you guys. The free shipping you offered at the time of my order, was still 10X faster than amazon or anywhere else I’ve ordered online. The quality of product is amazing. I just can’t say enough good things about your business and the way its run. I’m a loyal customer forever and wish you great success !! Thanks !!! Excellent product!!!! The wool is very soft and not at all scratchy! Made perfect quilts and a great dog bed. Customer service was outstanding! Thank you again for offering such a great product. Incredible product. I bought some for curiosity sake — I wanted to know what went into the pillows and mattresses. This is soft, light, springy. I layered the batting I got into the dog’s bed and she absolutely adores her bed now (and uhm… so do we. It’s really comfortable.) When I do home projects that call for batting and stuffing — I will buy more of this product.